This is a typical Italian end to a meal. It's a mix of our strong coffee and delicious ‘gelato.’ You can use whiskey, cognac, “amaro” or your favourite liquor. Don’t worry, it helps the digestion. So easy and so tasty! Mix very hot coffee with sugar and whiskey. Place ice cream in glasses and pour the hot mixture on top of each serving. 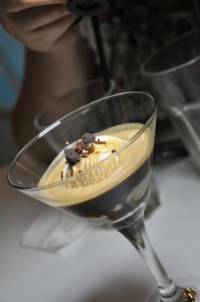 Garnish with grated chocolate and coffee beans.